Pleasant Acres Stallions is pleased to announce that Bucchero – the impressive repeat winner of the $200,000 G2 Woodford Stakes at Keeneland ­– ­will stand in Florida for the 2019 breeding season with a $5,000 fee. Bucchero is the first son of rising star Kantharos to enter stud, and his next start is at the Breeders' Cup Turf Sprint on his home track, Churchill Downs, Nov. 3, 2018. Bucchero bears a striking resemblance to Hill 'n Dale Farm's rising star Kantharos, whose 2019 fee was just increased to $20,000. Kantharos has produced more than 70% winners from five crops of racing age – 155 winners to date from 220 starters. His progeny includes 17 stakes winners, four at the graded level, including Bucchero and Breeders' Cup Sprint contender XY Jet. Kantharos is also sire of World of Trouble, a 3-time stakes-winning and graded-stakes placed 3-year-old who is out of a Valid Expectations half-sister to Bucchero, Meets Expectations. She is also the dam of a full brother to World of Trouble that sold at the recent September Keeneland Sale for $285,000. With a record of 11-6-3 in 30 starts through four seasons, Bucchero has career earnings of $937,936 to date. He is currently the richest Indiana-bred to have raced. Bucchero has won stakes long (1 1/16 miles) and short (six furlongs) on dirt, at 5 ½ furlongs on turf and he has been stakes-placed on a synthetic surface. Throughout his career he defeated 20 different graded stakes winners including Grade 1 winners Lady Aurelia, Marsha, Breeders' Cup champion Mongolian Saturday, and Undrafted as well as Grade 2 and Grade 3 winners including Disco Partner, Pure Sensation, Hogy, and Holding Gold. As a small ownership group, Ironhorse Racing Stable focused mainly on the Indiana incentive program during his 3- and 4-year-old career. However, Bucchero's 5-year-old campaign was expanded to open stakes nationally where he earned a 99 Beyer Speed Figure in the Sen. Robert Byrd Memorial Stakes before stunning the Keeneland faithful with first place in the 2017 G2 Woodford Stakes – earning a ticket to the G1 Breeders' Cup Turf Sprint. Bucchero firmly stamped himself as a top U.S., and eventually world-class, turf sprinter with a gallant fourth-place effort, beaten by a length. The flashy chestnut continues to display the uncommon ability and durability to retain top-class form into his 6-year-old campaign where he was second in Keeneland's G2 Shakertown Stakes this past April, and a troubled third in the G3 Turf Sprint at Churchill Downs. Bucchero was subsequently invited to compete against some of the worlds' best turf sprinters at the prestigious Royal Ascot meeting in the G1 King's Stand Stakes racing on a straight course without Lasix, Bucchero finished an inch from fourth, beaten by European stars and G1 winners Blue Point, Battaash, and Mabs Cross while defeating the champion Lady Aurelia for the second time in two meetings. In his most recent effort, Bucchero defended his Woodford title, winning as the favorite, and becoming the first horse to take the Woodford back-to-back as a Grade 2 race. Bucchero will join stallions Amira's Prince, Beau Choix, Handsome Mike, Neolithic, Ride On Curlin, and Treasure Beach at the 220-acre farm located just northwest of Ocala. Pleasant Acres Stallions has received many accolades for excellence, including 2017 DRF Florida-bred Beyer Award, 2009 Florida Breeder of the Year, 2009 Florida Broodmare of the Year, Breeder of the 2009 Florida Horse of the Year, and was ranked third in the nation for leading breeders in 2009 by average earnings per starter with 10 or more starters. 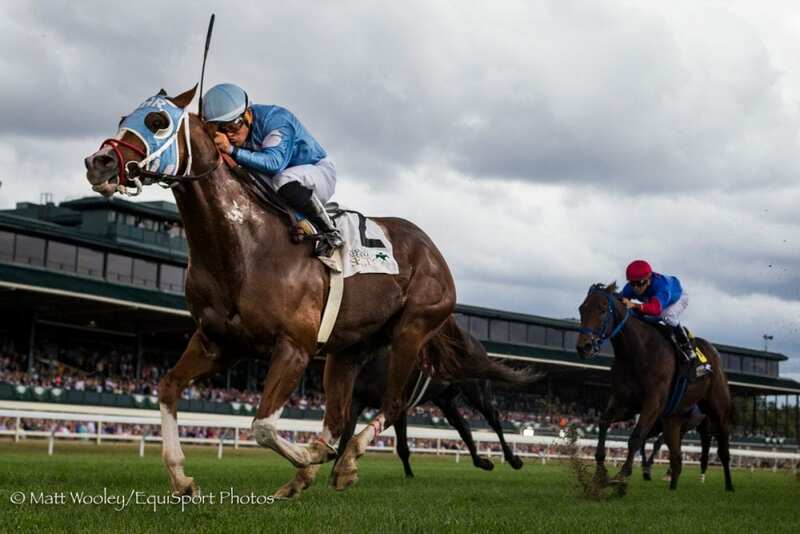 This entry was posted in Bloodstock and tagged 2019 stud fees, bucchero, Harlan Malter, Ironhorse Racing Stables, joe barbazon, Kantharos, michael trombetta, Pleasant Acres Stallions, Tim Glyshaw by Press Release. Bookmark the permalink.